We posted about a slick emanating from the Taylor Energy site on April 28th. And surprise, surprise a mere 12 days later, what should we see but yet another slick. In 2008 Taylor Energy set aside over $600 million to pay for work related to the chronic leak that we have covered extensively since it came to our attention in 2010. As you can see in this image collected by the European Space Agency’s Sentinel 2 satellite, as well as in numerous other images we have collected, their work to date doesn’t seem to have stemmed the leak. 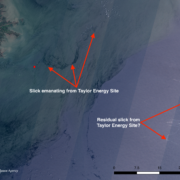 Sentinel 2 image collected of the Taylor Energy Site on May 8, 2017. Which begs the question: why is Taylor suing the government to return the $432 million remaining in trust? That money was set aside for work that is yet to be finished. Why would they think they have earned it back? It’s been a relatively quiet hurricane season in the northern Gulf so far this year – knock on wood – but right now a tropical storm is gaining strength and moving north off the Yucatan Peninsula and into the central part of the Gulf. The current forecasts show Karen strengthening to Category 1 (the weakest level of hurricane) sometime late Friday night as the storm center reaches the offshore oil platforms and pipelines, and making landfall along the Gulf coast near Mobile, Alabama early Sunday morning. But of course, this could change, so get the latest info from the National Hurricane Center. 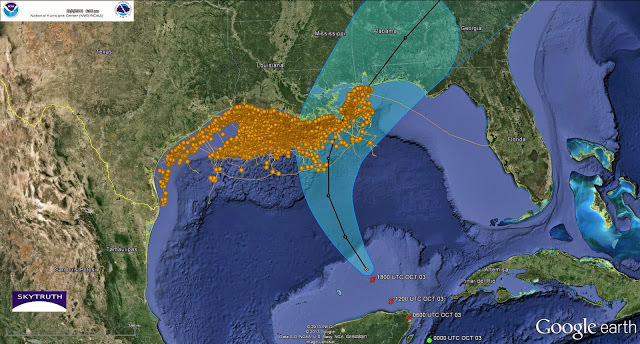 Forecast track (black line) for center of tropical storm Karen. Pale blue envelope shows cone of uncertainty for the centerline. Offshore oil and gas platforms are orange dots; seafloor pipelines are thin orange lines. Forecast data from NOAA/NWS/NHC. Forecast showing probability of tropical storm-force winds occurring over the next 120 hours. Offshore oil and gas platforms are orange dots; seafloor pipelines are thin orange lines. Forecast data from NOAA/NWS/NHC. We’re hoping, as always, for minimal damage and no injuries as Karen makes her way through. And that we won’t see much pollution from storm damage to offshore and coastal oil and petrochemical facilities, as we did after Isaac, Ike, Katrina and Rita. Those were all much stronger storms than a Category 1 hurricane, so we’re hopeful Karen will leave no such damage in her wake. Substantial amounts of pollution were released into the environment due to damage from the only hurricane to make landfall on the Gulf Coast in 2012. Harmful chemicals, including recognized neurotoxins and carcinogens, were released due to damage from the storm. Despite advance warning of the storm path and intensity, operators used the weather as an excuse for polluting. Fossil fuel infrastructure in the Gulf Region is vulnerable to predictable tropical weather events. Oil from the BP / Deepwater Horizon disaster continues to wash ashore. We believe this is a particularly important issues as pressure is building to expand offshore oil and gas development to new coastlines, including hurricane-prone regions of the Eastern Seaboard like Virginia and North Carolina. 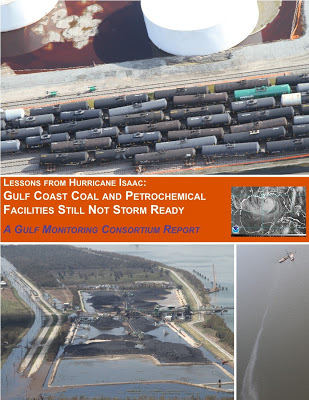 In evaluating the trade-offs between offshore development, tourism, and fishing, citizens of these areas should be aware of the constant drumbeat of pollution reports we observe during routine petrochemical extraction and processing operations, and the repeated incidence of serious pollution that occurs when strong storms hit the coast. We routinely observe significant pollution in the wake of strong storms. The coastal facilities required to support offshore oil and gas drilling continue to show dismaying vulnerability to storm damage. 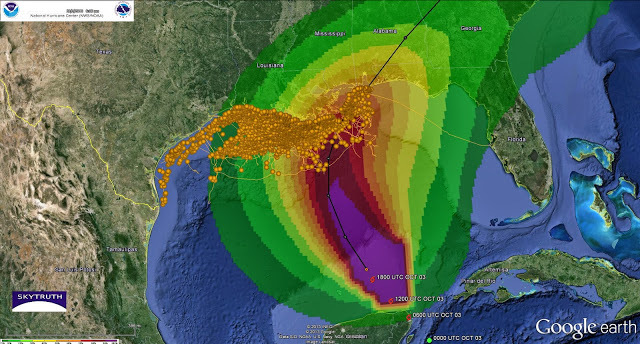 We found this to be true after hurricanes Katrina, Rita, Gustav, and Ike; we experienced it yet again with Hurricane Isaac; and we’re reminded of it on a daily basis as we monitor the ongoing oil leak from a Taylor Energy platform destroyed in 2004 by Hurricane Ivan. 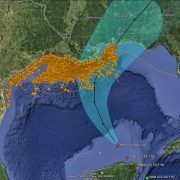 About GMC: The Consortium is a rapid response alliance that collects, analyzes and publishes images and other information acquired from space, from the air, and from the surface in order to investigate and expose pollution incidents that occur in the Gulf of Mexico and Gulf Coast region. Below: Image highlights from GMC monitoring trips and Investigations – photos may be reproduced so long as credit is attributed to the individual or organizations named. So now maybe we’ll get some answers: last week a judge threw out two motions filed by Taylor Energy to dismiss the lawsuit filed against them by Waterkeeper Alliance (one of the founding members of the Gulf Monitoring Consortium) for their chronic leak in the Gulf of Mexico that’s been spilling oil 24/7 from a cluster of wells damaged by Hurricane Ivan nearly 9 years ago. Now this legal action can proceed. 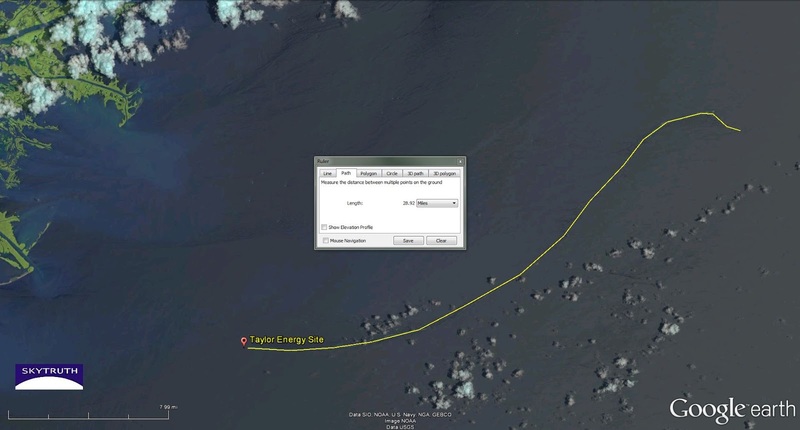 SkyTruth is not involved in the legal action, but we’ve been tracking this spill since we “discovered” it on satellite imagery during the BP / Deepwater Horizon disaster in 2010. 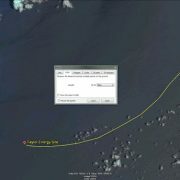 We’ve compiled a linked list of all the pollution reports for this incident that we could find at the Coast Guard’s National Response Center (mostly submitted as required by law by Taylor Energy or their contractors; some submitted by passers-by), all the direct observations and measurements of the slick on satellite images made by SkyTruth and recently by image analysts at NOAA, and observations from flyovers by Gulf Monitoring Consortium and On Wings of Care. We also attempted to estimate the cumulative amount of oil that has leaked into the Gulf since Hurricane Ivan. 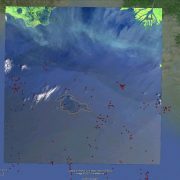 Now we have a powerful new tool to do offshore pollution monitoring, with the successful launch earlier this year of the Landsat-8 satellite. These images, while not as frequently acquired, are much more detailed than the twice-daily MODIS satellite images we’ve been relying on. 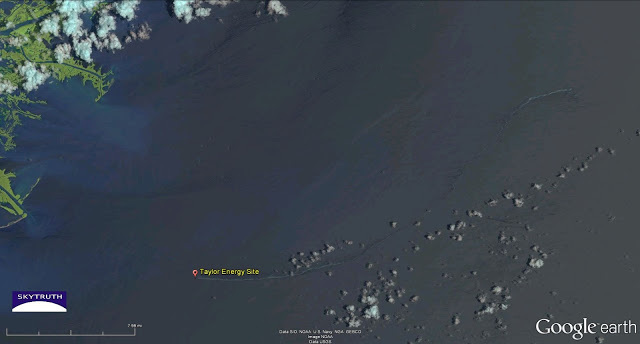 Detail from Landsat-8 image showing 30-mile-long oil slick emanating from site of former Taylor Energy oil platform destroyed during Hurricane Ivan in September 2004, about 11 miles from tip of Mississippi Delta (green areas at upper left). Image taken on June 18, 2013. See below for measurement. Clouds and shadows at lower right and upper left. Direct measurement of slick on June 8, 2013. 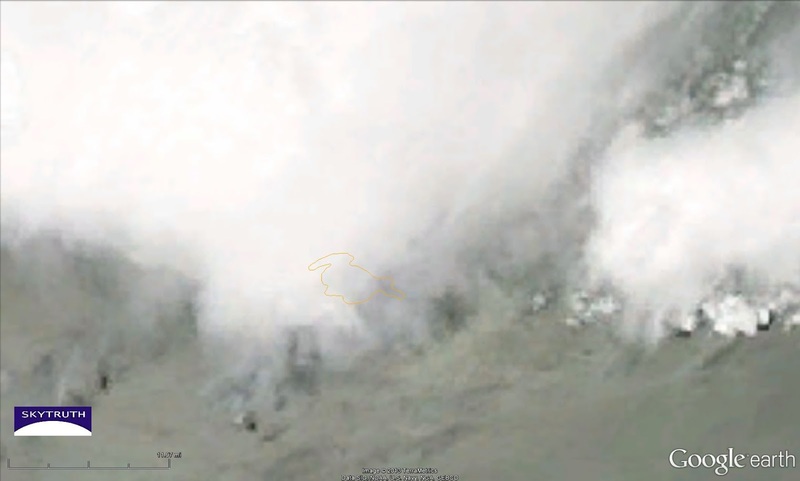 Our observation shows the slick was nearly 30 miles in length. NOAA satellite experts agreed. But on that same day — in fact, at 10am local time, almost exactly the moment the Landsat-8 satellite passed overhead and captured this image — Taylor Energy reported a slick that was 10 miles long. Taylor does their observations by aerial overflight, so it’s possible their pilot just couldn’t follow the slick over the full 30 mile distance. But this isn’t an unusual discrepancy: we, working with researchers at Florida State University, have noted systematic under-reporting by Taylor, and by polluters in the Gulf in general. Polluters beware: when the European Space Agency’s Sentinel-1 satellite is launched, we’ll soon have radar imagery back in our monitoring toolkit. That will open up a lot of new monitoring possibilities. We’ll need a few more eyeballs looking at images around here to take advantage of these great new data sources, so if you’re interested in becoming a volunteer skytruther, or contributing to our work, please contact us! We’ve been using the new Landsat-8 satellite imagery to help monitor pollution events in the Gulf of Mexico. 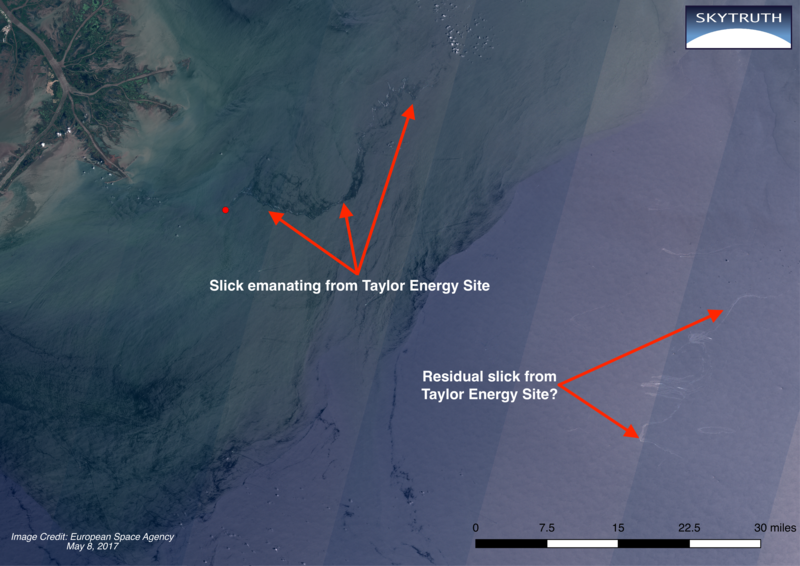 With a spatial resolution of 25 meters, this imagery is much more detailed than the twice-daily MODIS imagery (250 meters) that we used throughout the BP / Deepwater Horizon spill. But it takes a lot more Landsat images to cover the entire Gulf, and although we’re getting about 8-15 images of the Gulf region per day between Landsat-8 and Landsat-7, that’s not enough for complete daily coverage. Detail from a Landsat-8 satellite image (inset) taken on July 18, 2013, showing a small apparent oil slick (orange outline) in the Eugene Island area off the Louisiana coast. Oil and gas platforms shown as small red dots. 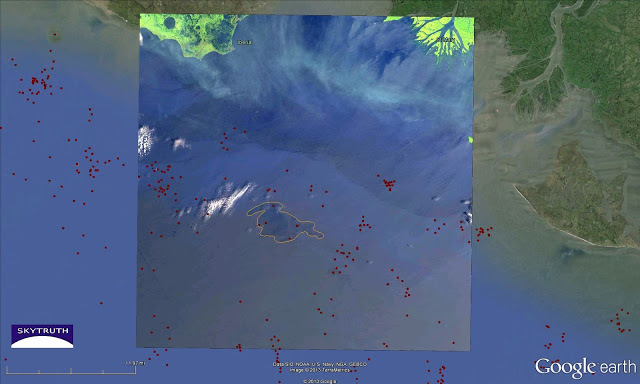 There are five oil and gas platforms (red dots) within the area of the slick. They all lie within lease blocks 44, 45 and 51. As far as we can tell, no reports of a slick were filed with the National Response Center yesterday, even though this was probably visible to anyone on those platforms (these could all be unmanned — we haven’t checked). See our Alerts map for the NRC reports in this part of the Gulf. This doesn’t seem to be related to the incident we posted on Facebook yesterday, where a work boat came to port covered with drilling mud from a problem at an Apache drill rig in the Eugene Island Block 136. That’s about 37 km (23 mi) south of this slick. Detail from a MODIS/Aqua satellite image (same area as shown above), taken about 4 hours later on July 18, 2013. Slick outline (orange) shown for reference.